What are the best mid arm quilting machines to get? 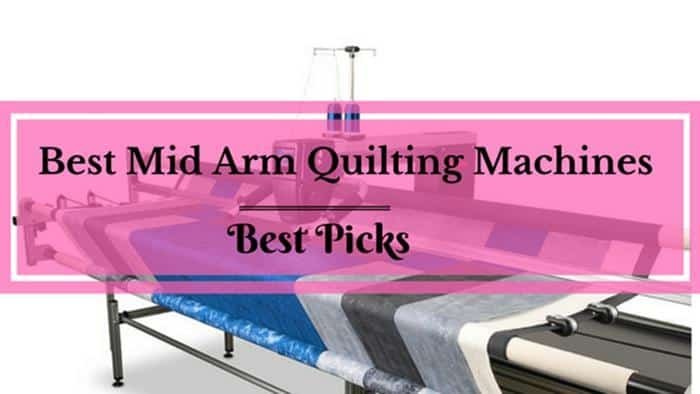 If you are here to know about the best mid-arm quilting machines, you're in luck. Quilters are passionate hobbyists. They love their craft although it is time-consuming and expensive. But glory goes to our finest sewing machine makers. They have not let this craft die in this fast-paced world. Are you wondering how? By building conventional quilting machines and incorporating the latest technology. The machines are easier to operate and make it simpler to create the design of your choice. Mid-arm sewing machines are perfect for people who have intermediate skills. But don't want to work with a large machine. They are different from home-based quilting machine and long arm quilting machines. Why do home quilters opt for a mid-arm quilting machine vs. a long-arm quilting machine? What are the benefits of a mid-arm quilting machine? Janome’s 1600P-QC is a powerful work-horse with speeds of 1600 stitches per minute. It is a heavy duty machine. There is also have a downgraded version of this beast. The Janome1600P-Q. Almost all machines do have presser foot. But many lack a controlling sensor system. Not so with the 1600-QC. It has a presser foot sensor that prevents you from starting the machine when the presser foot is UP. You can adjust the knee lift from left to right to the point that suits the way you operate. The machine memorizes your needle setting. You can set the needle for UP when the machine stops. Or you can set it down while sewing the corners or hems. Winding the bobbin runs separately from the main sewing motor. So, you can multi-task and save time. It is a fast machine. But you can select it speed with the front slider to match your requirements. The 1600P-QC applies up to 11 lbs of force. It means you can sew through multiple layers with ease. There are many other features. These include an automatic thread cutter, reverse sewing, dual lighting, and 6mm stitch length. You're never disappointed when it comes to machines produced by Grace. In the case of the Q'nique 14+, it's the huge 14” throat and comfortable hand grips that make it a standout. This machine can be categorized as both a long arm and a mid-arm quilting machine. So, we've also included it in the long arm article. It is a fast machine running up to 1800 stitches per minute. An OLED display screen with a menu that is simple to follow. A motorized bobbin winder that allows you to wind the bobbin without running the machine. LED lights that make it easy to see the detail of your quilting. Four different sewing modes for the flexibility you need. Controls that are placed on the handles for your convenience. A great time saver. A large M class bobbin. A stitch regulator and many more. Brother’s Dream Quilter comes with a 15-inch long throat. And has many significant long-arm quilting machine features. You can quilt in freestyle as well as in a patterned manner. Adjustable speed from 90 to 1800 stitches per minute. Custom handles with control buttons on them. A big 5-inch LCD touchscreen. A freestyle quilting foot and up to 10 different sized quilting needles. A speed control check with an over-speed warning. 4 to 16 stitches per inch to choose from. There's one drawback about this model. It's not readily available online. You'll have to buy it from your local Brother dealer or retailer. Make sure you get to see it in action first. Ask for a demo or when they're running a quilting workshop. Long arm quilting machines are bulky and take up a lot of real estate. You could find your workstation area is restricted for space. Not a professional quilter? Then don't go to the expense of investing in a substantial long-arm quilting machine. Home quilters can undertake different projects not related to quilting. That's because of the options available on a mid-arm machine. Other benefits include an easy upgrade path. And you can attach frames and an extension table whenever required. With long-arm quilting machine tables are usually attached. And being so specialized it's challenging to undertake other projects. But there are a few home-based options for the long-arm quilting machines. That's if you want to travel that path. Throat space is an essential factor for quilting. Too small and you're severely limited in the number of projects you can do. Many mid-arm quilting machines, though, have an ample throat size. It means quilters using these machines can complete most projects. The body of mid-arm machines is specially engineered. So, quilters can see and access the entire work from their work position. That aspect of the design is borrowed from the long arm quilting machine. Whereas the needle placement and working design are adopted from domestic sewing machines. Make sure you can choose the bobbin size that suits your requirements. Most mid-arm machines are built to handle either L or M sized bobbins. You select your preference when you buy. Mid arm machines are a hybrid. They have the features of both a domestic and a long-arm machine. So, if you're looking for a stitch regulated machine, it shouldn't be hard to find one. Mid-arm machines are cheaper than the long arms. And many home-based professional users opt for this version. It can easily fit into a workroom. The models discussed in these articles are the best of the mid-arm quilting machines. Including the Grace model which is also a long arm machine. Understanding the capabilities of a machine before you buy is crucial. Always check out a model before you buy. Visit a retailer and attend quilting workshops to see and work with it in action. Meeting other quilters is always helpful. They'll share their experiences of a machine and guide your decision. And help you become a better quilter. So, what's the best for beginners with a limited budget? It's the Janome 1600P-QC. If you can stretch the budget, do yourself a favor and buy a Grace Q’nique 14+.